Q: Is Tim Tebow left handed? 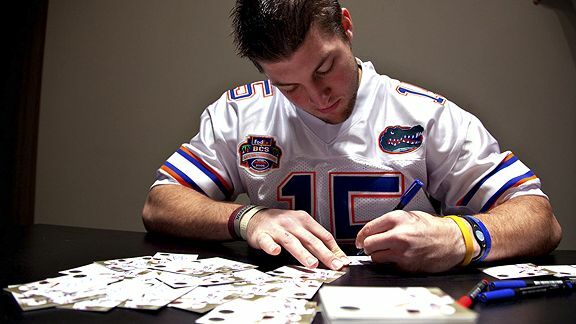 Yes, Tim Tebow is left handed. Looks like God has different plans for Tim Tebow. The sensational college turned sensationalist pro-football quarterback was last spotted applying for a job at Tim Hortons. Sources say he was denied the starting shift manager position and placed as a 3rd string, late-night fry-chef. It’s been an interesting run for the Florida native. He received the renowned Heisman trophy as a sophomore and led the Gators to a National Championship. And while he can bench press over 400lbs, his faith in God is the strongest part of his body. He’s very open with his alignment with God, which translated to a lot of 4th quarter, last minute wins and a couple runs in the wildcat with the Jets. This is proof that to get a sweet sports deal, you have to side with Satan. Selling your soul to God just doesn’t translate to W’s. Just look at Wayne Gretzky, Michael Jordan or Tiger Woods. Omaha Beef’s indoor football team has offered Tebow a whopping $75-a-game contract. I wish I made that up. Word on the indoor circuit is they throw the best after parties, with all you can eat prime rib, sirloin and hookers. Oh, and Justin Bieber always makes a visit.